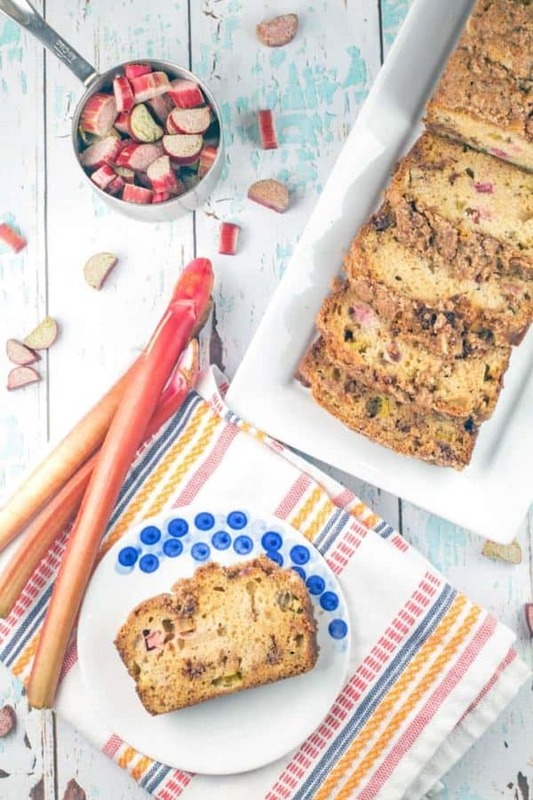 This cinnamon streusel rhubarb bread is an easy, mix by hand, moist and tender quick bread jam packed with fresh rhubarb and a double dose of cinnamon streusel. If you follow a lot of food blogs (which I do), you might notice a certain theme this time of year. The sun starts rising a little earlier and setting a little later in the northern hemisphere. The temperatures start to get a little warmer. The first daffodils start to sprout. And… every food blogger in existence shares a rhubarb recipe. Rhubarb. 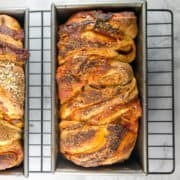 It’s like the pumpkin spice latte of the food blogging world: it’s not spring unless you’ve baked with rhubarb and made sure everyone else knows that you’re using the strangest, trendiest of spring vegetables. Guilty as charged. Two years ago, this rhubarb simple syrup which went into Rhubarb Collins. Last year, strawberry rhubarb oatmeal bars. 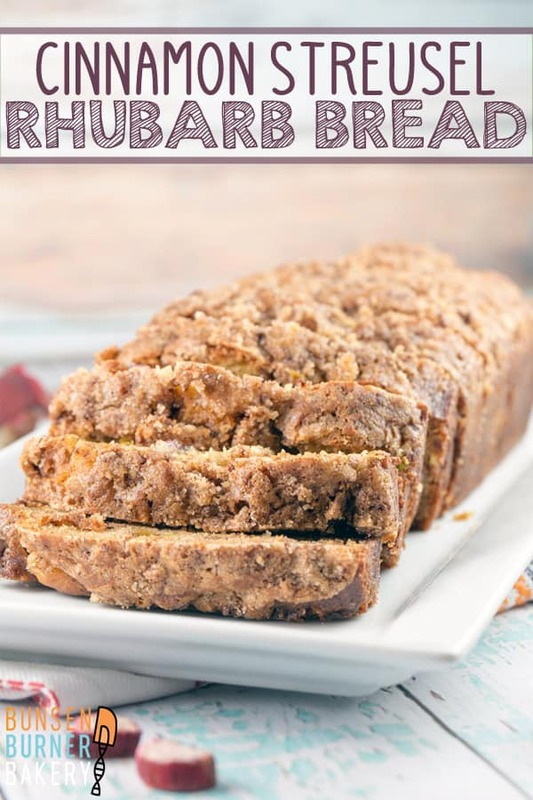 And this year, I will be fulfilling my contractually required food blogger rhubarb recipe with this Cinnamon Streusel Rhubarb Bread, serving as my fifth recipe in my year-long Quick Bread of the Month series. Seriously, why do we even eat rhubarb? I can answer that on a personal level — because my CSA gives it to me every year — but how did we, as a species, start eating rhubarb? It’s stalky, it’s bitter, and oh yeah… it’s poisonous. Grab a stalk and start chewing, everyone! Rhubarb is a stalky vegetable, similar to celery. Unlike celery, however, rhubarb is tart — so tart, in fact, that it’s very rarely consumed raw and almost always cooked with lots of sugar. In fact, because it’s used like a fruit in baking so much, a New York court deemed rhubarb a fruit for tax purposes, even though it’s really a vegetable. Have you ever wondered why rhubarb purchased at the grocery store is sold as just the stalks, while other vegetables, like beets, come with the greens still attached? It’s time for my favorite subject… kitchen chemistry! Don’t eat rhubarb leaves! Rhubarb leaves contain oxalic acid — a reducing agent. The conjugate base (high school chemistry flashback!) 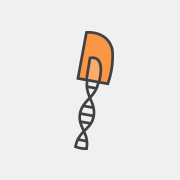 of oxalic acid is oxylate, which chelates metal cations — meaning that oxalic acid is great at removing rust. Oxylate is the major active ingredient in Bar Keeper’s Friend. And yet someone, somewhere, decided we should cultivate this plant for human consumption. I’m a huge fan of using all parts of a vegetable and routinely make pesto out of beet greens or carrot tops, but steer clear of those rhubarb leaves! Back to the rhubarb bread at hand. You know how some quick breads are really dense and sturdy and perfect for a smear of butter or jam? This is not that bread. Thanks to oil, buttermilk, and a whole lot of rhubarb, this bread is soft, moist, and full of cinnamon streusel crumbles. Literally full of them – there’s a layer in the middle of the bread, in addition to a coating on top! Be prepared for streusel crumbles everywhere when you slice the bread…. I highly suggest slicing it ahead of time so you can eat them all yourself before sharing the rest of the bread. Not that I did that before bringing the rest of the bread into the lab or anything. Nope. Not at all. 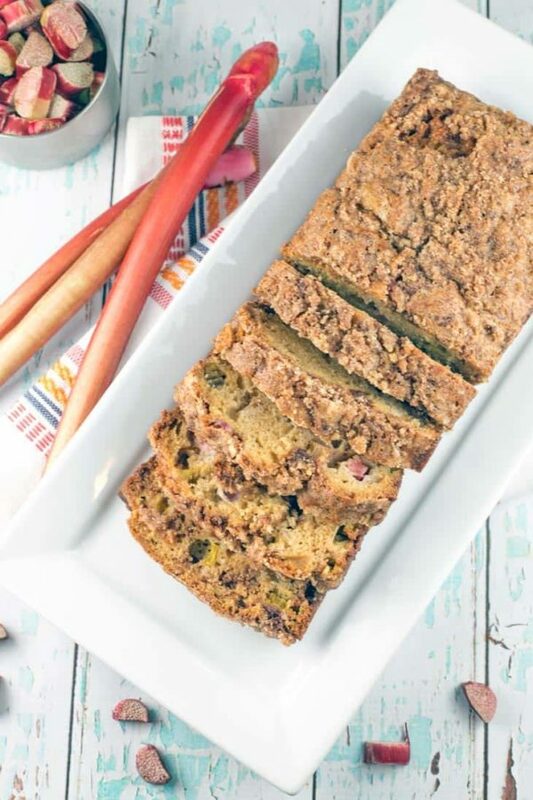 Oh, and did I mention how easy this cinnamon streusel rhubarb bread is to make? 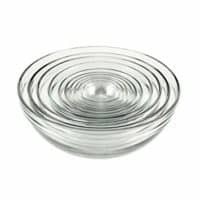 One large bowl for the batter, one small bowl for the streusel, and a whisk. That’s all you need. The easiest. Because this recipe includes baking soda, make sure to use buttermilk. We need the acidity of the buttermilk to activate the baking soda so the bread rises. Don’t substitute in regular milk! If you don’t have buttermilk, make your own equivalent to buttermilk by combining one cup of milk with one tablespoon of lemon juice and vinegar. Let this sit for 5 minutes before stirring into the batter. 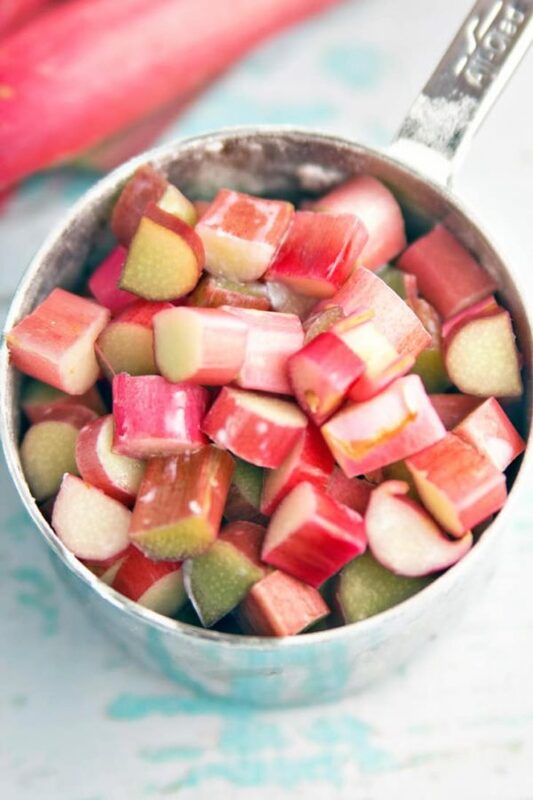 Cut the rhubarb into small pieces – since rhubarb is so stalky, we want to make sure each piece is no larger than bite size. 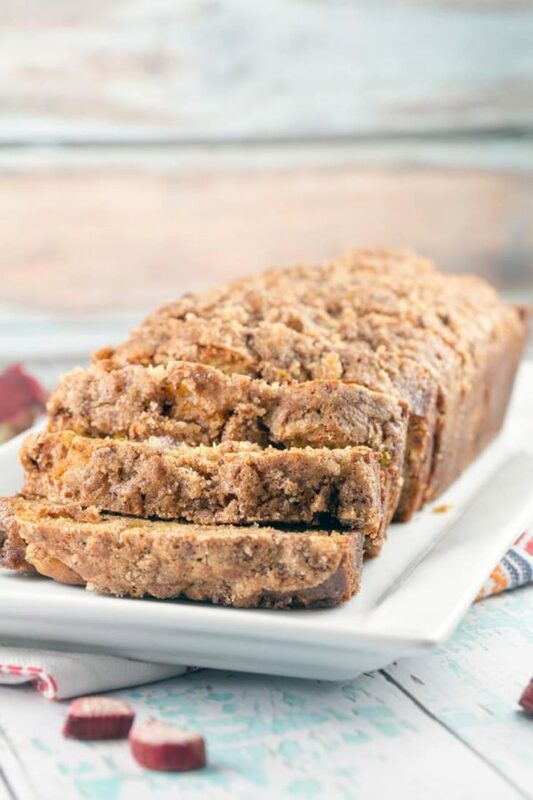 Cut the fully cooled bread with a serrated knife to help slice through all the delicious streusel topping! An easy, mix by hand, moist and tender quick bread jam packed with fresh rhubarb and a double dose of cinnamon streusel. 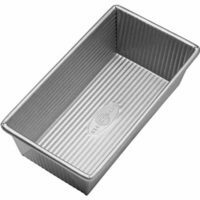 Preheat oven to 350°F and grease two 8×4-inch loaf pans. In a large bowl, whisk together the brown sugar, oil. egg, buttermilk, and vanilla until no clumps of brown sugar remain. 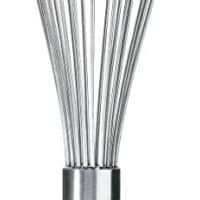 Slowly whisk in the flour, baking soda, and salt, stirring until just combined. Stir in the rhubarb. To make the streusel topping, combine all the streusel ingredients into a small bowl and whisk until the mixture resembles coarse crumbs. Pour a quarter of the batter into each of the loaf pans, using half the batter, total. Sprinkle half the streusel over the loaf pans, pressing down gently into the batter. Carefully spread the remaining batter over both loaf pans, topping with the remaining streusel. Bake 45-50 minutes, or until a tester inserted into the center of the bread comes out with a moist crumb. Cool for 10 minutes in the pan, then turn out onto a wire rack and allow the bread to cool. Cut with a serrated knife. 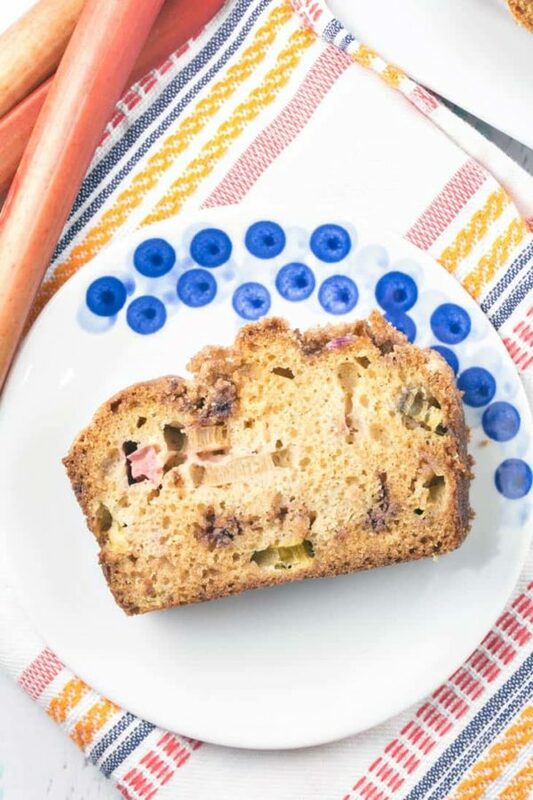 Cinnamon streusel rhubarb bread can be stored in an airtight container at room temperature for 4 days, or frozen wrapped in plastic wrap and stored in a freezer bag for up to 3 months. Thaw to room temperature before enjoying. Recipe adapted from Quick Cooking magazine. Lol! 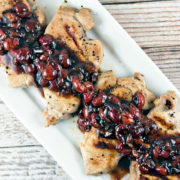 Your “contractually required food blogger rhubarb recipe” made me laugh. It’s true though – everywhere you look there it is. Truth be told – I’ve never heard of rhubarb before I started blogging and no matter how hard I try, I cannot for the life of me find it anywhere. So I guess no rhubarb baking for me this year. Maybe next year I will be part of the cool kids club haha. This bread looks so moist and delicious BTW. And no electric mixer required another plus! You know, I’ve actually never blogged a rhubarb recipe?! I better get on that! We grow rhubarb in our garden, but the plant is only small yet and it hasn’t yielded much. Perhaps if I get enough when the weather warms, I’ll just have to do that 😉 So funny, ‘it’s like the pumpkin spice latte of the food blogging world.’ Seems like it is EVERYWHERE these days, doesn’t it? No complaints, though, I do enjoy it and your recipe with the streusel on top looks absolutely delish! What? No rhubarb? And you’re even growing your own! Time to remedy that so you can keep your food blogger cred. 😉 Just poked around your site — the grilled halloumi and couscous salad looks AMAZING. I have no idea what this is from, but now I’m going to think about it every time I see rhubarb. 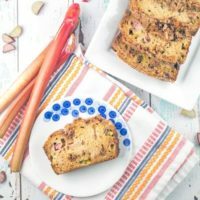 I just love rhubarb bread! This streusel topping looks amazing!